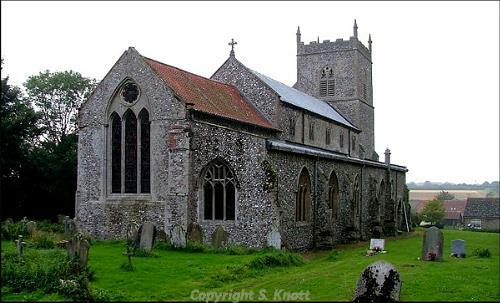 The parish of Sporle with Palgrave is situated in the Breckland district of Norfolk. It lies northeast of Swaffham, east of South Acre and west of Necton and Little Dunham. The name Sporle may derive from the Old English phrase meaning ‘clearing with an enclosure’. Palgrave may come from the Old English meaning ‘Paga’s grove or copse’. Sporle and Palgrave were originally separate parishes, each with their own church before they were combined into a unified parish. Both Sporle and Palgrave have a long history and were well established by the time of the Norman Conquest. Their population, land ownership and productive resources were detailed separately in the Domesday Book of 1086. This document mentions that Sporle was a royal manor with woodland and that Palgrave was held for the king by Godric and possessed a mill. The earliest sites to have been identified in the parish are prehistoric pot boiler scatters (NHER 19824 and 31953). These fire-cracked flints are evidence for the early inhabitants of the parish boiling water for domestic purposes. A mound of these burnt flints has also been recorded within Sporle Wood (NHER 31955). In terms of artefacts, the assemblage represents the entire Prehistoric period. Several Palaeolithic handaxes have been found (NHER 4129 and 4130) and there are a number of finds from the subsequent Mesolithic period, including a microlith (NHER 25277), two flaked flint axeheads (NHER 21663 and 21664) and blades (NHER 34519). Of course, the majority of the stone tools recovered from the parish date to the Neolithic period. Arrowheads (NHER 4133), axeheads (NHER 39583) and maceheads (NHER 4596) have all been reported. Aerial photographs of the parish show two possible Bronze Age ring ditches (NHER 18859 and 35932), but these are the only prehistoric sites on record. A few Bronze Age finds have been recovered, but there are far fewer artefacts from this period than the earlier parts of prehistory. A Bronze Age flint arrowhead (NHER 2685) and copper alloy palstave (NHER 4597) have been retrieved, as have sherds of pottery (NHER 4136) – possibly the earliest ceramic finds from Sporle with Palgrave. Metal detecting across the fields of the parish has helped to recover a couple of Iron Age objects. These include Iceni coins (NHER 25967 and 28569), a terret (NHER 28569) and a brooch similar to those of the La Tene style (NHER 28738). It is in the Roman period that we have the first convincing settlement site (NHER 13271). Fieldwalking in area to the southwest of the Whin Allotment Plantation recorded a large number of pottery sherds and tile fragments. The distribution and concentration of these were felt to be indicative of domestic settlement. Three possible Roman roads run through the parish (NHER 3697 and 4249). One runs from North Pickenham to Toftrees (NHER 3697) while a stretch of another lies to the rear of Whitegate Farm (NHER 4249) and the last one runs through Coates Common (NHER 4598). A decent selection of Roman artefacts has been discovered in Sporle with Palgrave. Along with mundane items like coins (NHER 4139) pottery sherds (NHER 4138) there were a number of more interesting or unusual items including a lead plumb bob (NHER 16655), cast bronze head from a figurine of Minerva (NHER 34520), a child’s bracelet (NHER 28809) and two fine Dolphin brooches (NHER 41766). The Saxon period is of particular interest in Sporle and Palgrave. In about 1813 four Saxon round barrows were removed from the northern end of Coates Common (NHER 4598). One of these contained horse bones and one contained six skeletons arrayed in two rows of three. Spears, shield bosses, brooches, beads and pottery urns were found accompanying these skeletons. Sadly, the farm workers discarded a number of other ironwork items recovered from the barrows. However, several exceptional Saxon metalwork items have been retained. The foremost of these objects are a rare Late Saxon patrix (NHER 32939) and a superb Middle Saxon strap end decorated with a fan-shaped motif (NHER 31559). 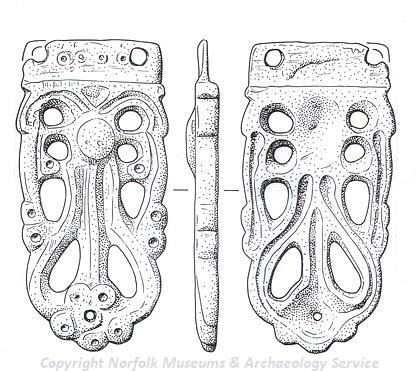 Other finds comprise a Middle Saxon/Late Saxon stylus (NHER 28738), a pair of Early Saxon tweezers (NHER 41776) and part of an Early Saxon mount from a hanging bowl that was decorated with a Celtic animal motif (NHER 29380). It is also interesting to note that a single 10th century Byzantine coin (NHER 32940) that had been fashioned into a brooch has been recovered from the parish; surely one of the more unusual finds. During the medieval period there were a number of smaller settlements within the parish. Many of these were abandoned by the latter part of the period, and aerial photography and fieldwalking have identified the earthworks and cropmarks of these villages. One such village was Great Palgrave (NHER 1058), which was mentioned in Domesday and survived until the 15th century. This village never had a church but the earthworks of streets and buildings are still visible in the grass here. Similarly the village of Petygards (NHER 13271), which sprung up around the edge of a common, was beginning to be depopulated by late medieval times and was completely abandoned at the start of the post medieval period. This site was identified by the dense concentration of medieval pottery sherds that was recovered. In addition, a house to the north of the deserted village site bears its name (NHER 4638), and the ornamental ponds of this property would once have formed the moat of a medieval manor house. The last of these deserted settlements is the hamlet of Cotes. Like Petygards this village grew up along the edge of Cotes Common after 1086, indeed it has been difficult to distinguish the sites of Cotes and Petygards apart due to their close geographic proximity (see NHER 13495 and 13271). However, unlike Great Palgrave and Petygards, Cotes survived in some form until the 17th century. The parish church of Sporle with Palgrave dates to the early medieval period. The Norman origins of St Mary’s (NHER 4166) can be seen in the chancel, with later Decorated and Perpendicular architecture also visible throughout the church. However, much of the complicated build history is obscured by Herbert Green’s restorations of the 1890s. Visitors should take the opportunity to look inside this church, as there are a number of important wall paintings depicting the Martyrdom of St Catherine. It is worth noting that the church was not the only religious foundation in the parish during the medieval era. To the south of St Mary’s, a Benedictine Priory Cell (NHER 4185) was established in 1123. It operated until 1414, and aerial photographs showed cropmarks relating to the layout of the cell. Sadly, little is now visible on site, but a few sherds of medieval pottery and metalwork have been recovered from this locale. A couple of other medieval features have been identified. First and foremost of these is Sporle Wood (NHER 31955), which is believed to date back as far as the medieval period. The moated site of the medieval Sporle Hall (NHER 4152) has also been identified near to the railway crossing on The Street. Several exceptional medieval small finds have also been recovered from the parish. These comprise a beautiful and complete spur buckle and seal matrix with a motif depicting a lion fighting a dragon (both NHER 1058), a bronze dragon-headed spout from a ewer (NHER 28325), a superb annular brooch (NHER 32942), a horse harness pendant in the shape of a bird (NHER 28738) and an enamelled half-figure of a saint from a Limoges shrine/casket (NHER 28569). By post medieval times, Sporle with Palgrave was engaged in a number of commercial activities. Two windmills (NHER 4161 and 16354) were marked on the 1836 Ordnance Survey maps of the area, and these mills continued to produce saleable goods until the beginning of the 20th century. Similarly, two brick kilns (NHER 4628 and 4637) are recorded for the parish, with the remains of one of these kilns still visible in 1962 (NHER 4628). Later on, the advent of rail transport would have helped to improve the access and the exchange of goods. The Lynn and Dereham Railway ran through Sporle by 1847 and continued to operate until 1968. In addition, several of the fine buildings within Sporle and Palgrave were constructed in the post medieval period. These include Little Palgrave Hall (NHER 4165), which dates to the 17th century with later 18th and 19th century additions and refurbishments. The building is of interest because a large quantity of medieval stonework, possibly from Castleacre Priory, has been incorporated in the fabric. Palgrave Hall (NHER 4162) was also built during this era, but this yellow-brick Victorian and Tudor style house is less impressive than its namesake. The final building of this type is the grand Old Rectory (NHER 8290), an early 17th century timber-framed house with brick and flint gables. Intriguingly, there are fragments of medieval window tracery from the church in the garden of this property. Evidence for less wealthy occupants of the parish is provided by the former workhouse, which stands on Bailey Row (NHER 37641). This building was initially constructed as a town house for accommodation of the poor in 1748. It later became a workhouse before it was sold off in 1841. Only a few of the more interesting post medieval artefacts will be mentioned in this summary, as the majority of finds are mundane or typical objects. A couple of items related to trade have been found including a cloth seal with a well-preserved merchants mark (NHER 29378), a Norwich farthing token (NHER 28738) and a Guinea coin weight (NHER 31559). Two other interesting items relate to leisure time, with half of a Jew’s harp (NHER 28809) and part of a bone domino (NHER 34520) numbering amongst the many post medieval finds from the parish. During the latter part of World War One (1916-18) Sporle with Palgrave had a military airfield (NHER 13626). At present the exact location of this airfield is unknown. However, the only World War Two structure in the parish is rather more obvious. It takes the form of a type 22c pillbox (NHER 32671) standing to the west of the parish, near to the A1065 road. Nearby is the most recent archaeological site in the parish: a Royal Observer Corps bunker dating to the Cold War era (also NHER 32671). The ventilation shaft of this bunker has been removed but it is otherwise intact with the internal furnishings still present. Thomas Sunley (NLA) 18 June 2007.